Welcome to Down On The Street, where we admire old vehicles found parked on the streets of the Island That Rust Forgot: Alameda, California. Once again, Alameda has managed to provide a cool International Harvester for our enjoyment, and this time it's a great big '65 Travelall D-1000. Around here, we don't sneer at modern leather-trimmed SUVs because they're faux-macho minivan substitutes- no, we sneer at them because they're making us soft! Here's an example of an off-road-ready machine made by a manufacturer of farm equipment, with an interior appointed in luxurious steel. You could get yourself a Travelall based on the D-1000 half-ton truck chassis for $2,705 back in 1965. 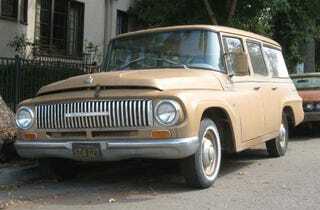 The half-ton '65 Suburban sold for $3,270 and the Jeep Wagoneer 4-door was $3,395. What a deal! Of course, you'd have to pay more to upgrade the Travelall from the 240-cube six to the 304 V8 (a wise investment for a vehicle weighing well over 2-1/2 tons). This appears to be a two-wheel-drive version, so you wouldn't want to take it on a camping trip involving heavy-duty mud-boggin' action. Ground clearance is still great, though, so those dirt roads will be no sweat. I really could have used this sort of diagram on the first three-on-the-tree car I ever drove- definitely would have saved me a lot of confusion.